After several Mewġa Mużika workshops, which took place during the last few months as part of the Valletta 2018 Cultural Programme, a community of more than 300 musicians will give a concert at Mdina Ditch. The final collective representation of Mewġa Mużika will be held on Sunday 9th September 2018. Although the collective representation starts at 7pm, the Sunday will be filled with fun activities for the whole family starting at 10am, including musical interventions by the group which led Mewġa Mużika: ondamarela, activities by Tal-Kultura volunteers, stop motion workshops by Solar Cinema where children can work on films using recycled material, rhythm and movement workshops, percussion and aerobics, games and other family activities. 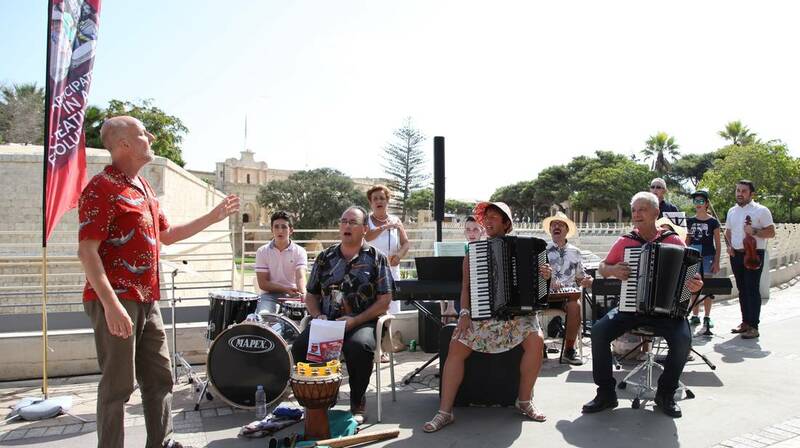 Mewġa Mużika, which is part of the Valletta 2018 Cultural Programme, is an interactive musical project led by Portuguese group ondamarela. This project involved over 400 people from different communities from January to date, with the youngest participant being only 6 years old and the oldest 80 years old. They participated in over 30 workshops, meetings and rehearsals in various locations around Malta and Gozo. The collective orchestra joined for this project is made up of about 300 people who play a variety of instruments, including handmade ethnic instruments, electric guitars, drums, stringed instruments, wind instruments, brass and other instruments. Accompanying the orchestra is a chorus of 30 people. Some participants are whole families, while others have found a second family within this community group. Valletta 2018 Foundation Chairman Jason Micallef said that this project has its roots in cooperation and collaboration and proposes the creation of a public musical performance which builds solidarity through music. Mewġa Mużika reinforces the belief of ​​Valletta 2018, that all citizens can have an impact on artistic initiatives and become co-creators in projects of this type. Parliamentary Secretary for Consumer Protection and Valletta 2018 Deo Debattista explained how music is a universal language that is learnt before words because the message that is not delivered by words is able to be delivered by music. Whilst urging the public to attend, he wished all artists a successful exhibition. Everyone has a chance to become a musician for Mewġa Mużika, whether a music lover, aspiring musician, and even if already a professional musician. The workshops are open to people of all ages, from all walks of life or musical field. This initiative also welcomes participants with no musical experience. If you wish to participate, send a private message on the Mewġa Mużika Facebook page, or visit ondamarela’s website. For more information follow Valletta 2018 on Facebook. snapping fingers, stomping, whistling and breathing. second life by reviving them through games.